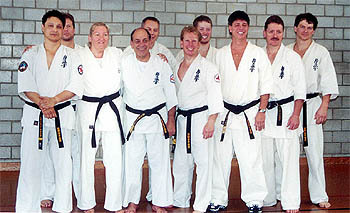 Hanshi at the First Ever Black Belt Camp in Switzerland in 2001. Hanshi is 3rd from the left in the front row. You don't stand in kiba dachi, you sit in it, he demonstrated and then you swivel your hips around like this to do your jun-tsuki. Spchhhlaat. One could just imagine a nose flattening with that sound! Now I always use the word Whang! when providing sound effects with a technique (when not kiai-ing of course), but then, I'm only a 1st kyu and he's an 8th dan, so he's got about 40 years of training on me, and is probably right. Eighth dan Hanshi Steve Arneil teaches Kyokushin like a human being, and not some mystical master of the martial arts, as many of the highest ranked martial artists are often portrayed. He uses human expressions, and makes jokes, both visual and oral. We did not hang on to his every word as though it was coming from some heavenly being, but we did listen. He isn't God, but he is GOOD. We were to enjoy a fair sampling of his techniques and teaching methods in the coming hours and, tiring as it was, my only regret was that I could not make it a regular event. Hanshi Arneil was invited to visit Sydney for a couple of weeks during August this year to give Kyokushinkai practitioners a seminar on some of his world renowned training methods. In addition to the weekend seminar, he spent nearly two weeks teaching at several of the Kyokushin dojo around Sydney and I had the good fortune to have time to be at a couple of his sessions. But more about that later. Steve Arneil was born in South Africa in 1934, got a degree as a mechanical engineer, and worked in copper mines. His interest in the Martial Arts was such that at the age of 17 he had a black belt in Judo, and was reasonably well versed in both Kenpo and Karate. This naturally led him to Japan where, in the late 1950s, he joined Mas Oyama's first dojo, then a transformed ballet studio behind Rikkyo University in Tokyo, only 500 meters from the current honbu. There, together with many of the other luminaries of Kyokushin, he trained, and talked, and trained, and helped in the development of the then embryonic Kyokushin karate, and then trained some more. He was the first person after Mas Oyama himself to complete the one hundred man kumite, surely the supreme test of spirit in a martial artist. He was 30 years old and a 3rd Dan at the time. Mas Oyama himself had performed this feat for three days in a row, and legend has it that he turned up on the fourth day to continue, but no one else did. At the time, Mas Oyama intended making it a requirement for the 4th or 5th Dan grading, but he soon found out that not everyone had the right stuff  but Steve Arneil did. In fact, recognition of his contributions to British karate and that of the rest of Europe as well was so widespread that the 8th Dan he currently wears was awarded, not by Kyokushin alone, but by the whole of the British karate community regardless of style. One of the countries that has swelled the ranks of the martial arts enormously is Russia. During the communist regime, martial arts were illegal and therefore only practiced clandestinely. During that time, when he visited the Soviet Union, it was as a fitness instructor and all training took place outdoors in tracksuits so that they could break into a jog at a moment's notice. Since the breakup of the USSR however, the number of IFK Kyokushin practitioners alone in Russia has risen to around 70,000 and the average dojo size is about 2000. Apparently, due to the great demand, and lack of dojo space, members train in shifts and queue outside the dojo in their dogi even in the bitterest cold of the Russian winter! Part of his ideas about being the head of the IFK is that local laws are local laws, and that local organisations should be permitted to work within those laws as they please, whether he (or UK law) approves or not. For example, in Russia and in Israel they practice Kyokushin style full contact from the age of nine! When a child gets KOed, his or her parents sit proudly by applauding, and wishing their child better luck next time. Here in Australia, we do not allow our competitors to compete in full contact tournaments until the age of eighteen (except as colts against each other), bearing in mind that our full contact tournaments are just that  no protection except for mouth and groin guard and some common sense rules about certain types of attacks e.g. groin, eyes, joints etc... Much as he disapproved of the Russian system, he had to stand by and accept it, as these were the local Kyokushin conditions, and local laws permitted it, and his leadership principles required it. Everything is relative. In Australia and the UK, childrens' competitions of this sort would be completely and utterly against the law for very sound health and welfare reasons In those countries however it can be argued that if KOed is all that will happen to your child, then things are pretty good, since the daily dangers on the streets are considerably greater! Steve Arneil, the engineer, probably hasn't done much engineering since he left Japan in the good old days, but it has influenced his training philosophies and teaching methods. During the seminar he very strongly emphasised the mechanics of karate, and demonstrated this by showing the inherent strength of a correctly executed sanchin stance. Actually, it was Sempai Cheryl Bailey who had the dubious honour of being chosen to illustrate his point. Using borrowed belts to mark the lines of the stance on the floor and in the air around her, he then spent a considerable length of time showing us how the sanchin stance was made up of mostly triangles, which are a naturally stable and strong shape, including a few resounding thumps and whacks to various parts of Sempai's arms, chest, and and legs to prove it. He even related it to the girders and beams in the ceiling structure of the dojo we were in. In the meantime Sempai Cheryl was still standing in sanchin. He then related another story of the old days back at the first honbu, where they used to train their buttocks for sanchin by holding a 10 yen coin between them and walk across the dojo. He even demonstrated the walk (without the coin) to everyone's amusement (you had to be there! ), except for Cheryl, who was still in sanchin dachi. Then he finished the discussion about the mechanics. After the demonstration was over, Sempai Cheryl walked away, seemingly as fresh as a daisy. But for those who continued to watch her, while of course keeping an ear and an eye on Hanshi, the effort she had undergone was evident by the way she surreptitiously wiped the sweat from her brow - numerous times. Until Hanshi's visit, I had always thought there was only one Sanchin Kata, the hard one, you know, where one has to contract every muscle and do ibuki breathing with each move. Hanshi taught us another two: the first is a gentle, tai chi-esque one in which one does each move, including the breathing, slowly and smoothly. This one can be used to relax after a fast and furious part of a training session. No strong muscle contractions, just flow. The second form was a power sanchin kata; fast, hard, and with a kiai at each move. That's not hard, you might say. True enough, if you only do it once through. Hanshi uses it as part of his tournament training. All the non-fighters do the tai chi-like version. The fighters do the kiai version TEN times. Everyone must finish at the same time. We tried it  black belts with kiai and all others did the flowing version. When the slow version was finished, the result was kyu grades 1 and black belts 6, and according to Hanshi, not a very good six. The black belts, ranging from 1st to 5th dan, included several national champions and international competitors. Now we know part of the reason why, in 1975-76, Hanshi's team was the first non-Japanese team to win the World Karate Championships! We've all done kihon and ido geiko  seemingly endless repetitions of the same technique or combination either standing still or moving back and forth. Hanshi Arneil takes it a step further, making it harder, but perhaps more appealing to the beginner, certainly so for the more advanced. Firstly, you change direction with each combination. Doing this with a normal lunge punch is simple, but when using combinations, say front leg kick, back leg kick, block, and punch, or changing techniques with each change of direction, you find that your brain may well be working harder than your body! Think quickly, and work both sides of your body evenly, are the principles here. We always thought that we were fulfilling those principles, but this proved us wrong. The second point, and this is what can make it more appealing to beginners, is that he varied the method of execution of the techniques between formal style and street style. This way, a raw beginner can begin to learn what he or she probably came to learn  self defense  without having to spar and risking injury (or injuring someone) before they have developed better control. A formal punch looks nothing like a street-style punch, but they both have their uses. The former helps you to develop power and control, and the latter teaches you speed and focus. Put them together and you've got good karate! Steve Arneil's karate is both eclectic and undogmatic. He has no qualms about adopting principles and techniques from others, even non-martial arts, and he has no problems in dropping things that don't work well. The tai-chi like sanchin kata mentioned earlier is a case in point. The pressure point releases he showed us later also were un-Kyokushin. This is what Kyokushin was in the beginning, he said, a mixture of different styles. The Kyokushin I had been taught was dogmatic; no one thought to question the words from high. During the seminar, Hanshi told us we were all so flatfooted in our technique, and made it sound like a sin. I don't think he was watching me. He was watching the front line with the sempais, senseis, and shihans. And flatfooted we were, but only because that's what we had all been taught to do. No one dared to think otherwise. We had been Told that this was The Only Way. Instead, he taught us to think deeply about what we were doing and how we were doing it, not just with stances, but all techniques. He also said not to be afraid to question your seniors (might I suggest, tactfully) because they too are human. If you haven't already guessed it, I like Steve Arneil's Kyokushin Karate! It has retained the vigour of youth that Sensei Cameron Quinn manages to convey in his book (The Budo Karate of Mas Oyama, Coconut Productions, Brisbane) about the origins and development of Kyokushin. It's still hard, in fact, in some ways its even harder than what we had before. But it's fresh and stimulating, practical, and it allows you to flex your cerebral muscles to counterpoint the flexing of your corporal muscles, thereby giving you a good overall workout. It is a well rounded karate meant for the thinking karateka among us.